Iontaobhas Na Gaelscolaíochta » What is Gaelscolaíocht Éireann? Cad is Gaelscolaíocht Éireann ann? | What is Gaelscolaíocht Éireann? Gaelscolaíocht Éireann (GSÉ) is a new project established in August 2006, with funding from the European Union to improve cross-border public sector cooperation and service delivery in the targeted areas of the six border counties and the six counties in the north of Ireland. GSÉ recognises the different policy contexts of Irish-Medium Education on both sides of the border. inform and exchange information on policy and practice through a number of briefings and study visits. encourage the development of good models of strategic service delivery by learning from each other and engaging with experts from other counties involved in similar processes, particularly Wales and Scotland. enhance local service delivery by engaging regional and local stakeholders in the process. What is the structure of Gaelscolaíocht Éireann? The project received funding under the Special European Union Programming Body (SEUBP) Measure 5.2 Improving Cross-Border Public Sector Cooperation. It will function as a cross-border Steering Committee with representatives from the key organisations with responsibilities for the Trust Fund for Irish-Medium Education. It will also convene a cross-border Forum for all organisations involved with the Trust Fund for Irish-Medium Education to encourage greater cross-border exchange of information and on models of good practice. The priority areas of work for the Steering Committee are to focus on exploring the benefits of developing joint projects at departmental level, identifying and disseminating examples of good practice around the country, and finding new methods of attracting additional resources into the sector. The Steering Committee will have representatives from Comhairle na Gaelscolaíochta/The Council for the Trust Fund for Irish-Medium Education (lead partner), Gaelscoileanna (lead partner), Iontaobhas na Gaelscolaíochta/the Trust Fund for Irish-Medium Education (lead partner), Forbairt Naionraí Teo/Preschool Development, Foras na Gaeilge/The all-Ireland Language Body, the Department of Education (DENI) and the Department of Education and Science. 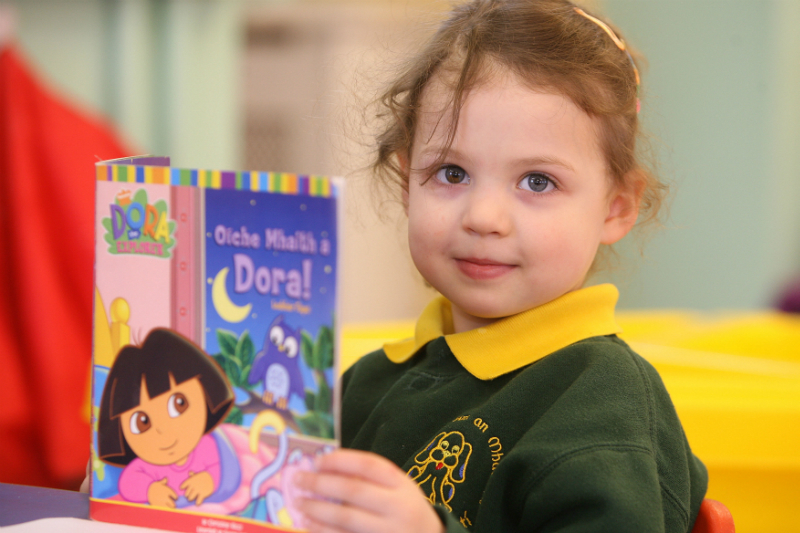 (www.iontaobhasnag.com) was established in 2001 by the Department of Education (NI) following from commitments made under the Good Friday Agreement to promote the Irish language and Irish-Medium Education. Its remit is to provide financial and technical support to the Trust Fund for Irish-Medium Education development and projects not eligible for mainstream government funding. It works in tandem with Comhairle na Gaelscolaíochta in seeking to implement the Development Plan for the sector. liase with the Department in matters relating to Irish-Medium education, for example planning, new schools, the panel, conditions for recognition etc. and, to provide in-service training for staff and training for Boards of Management on a range of issues. Forbairt Naionraí Teo (www.naionraí.ie) is an all-Ireland voluntary organisation which supports the promotion of education and care services in Irish for children from birth. 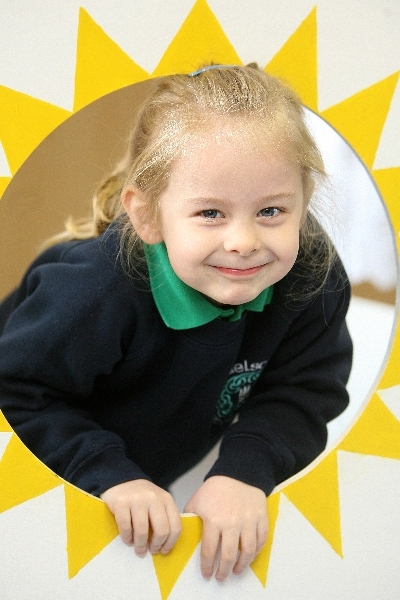 Established in 2003 it is governed by the UN Convention on the Rights of the Child, the Childcare Act 1991 and the Childcare Regulations (Pre-School Services) 1996. The following groups are represented on the Board of Directors: Altram, Comhairle na Gaelscolaíochta, Foras na Gaeilge, Gaeloiliúint, Na Naíonraí Gaelacha and Údarás na Gaeltachta. Forbairt Naíonraí Teo., is grant aided by Foras na Gaeilge and the Department of Justice, Equality and Law Reform. It provides support to establish, develop and administer the following services through Irish: naíolanna, naíonraí, after school services, summer camps and parent/guardian and toddler groups. Advice and assistance is available to individuals or groups wishing to use Irish with children. Foras na Gaeilge (www.forasnagaeilge.ie) was established in 1999 and it is the body responsible for the promotion of the Irish language throughout the whole island of Ireland. support Irish-Medium Education and the teaching of Irish. The background to the Gaelscolaíocht Éireann project. 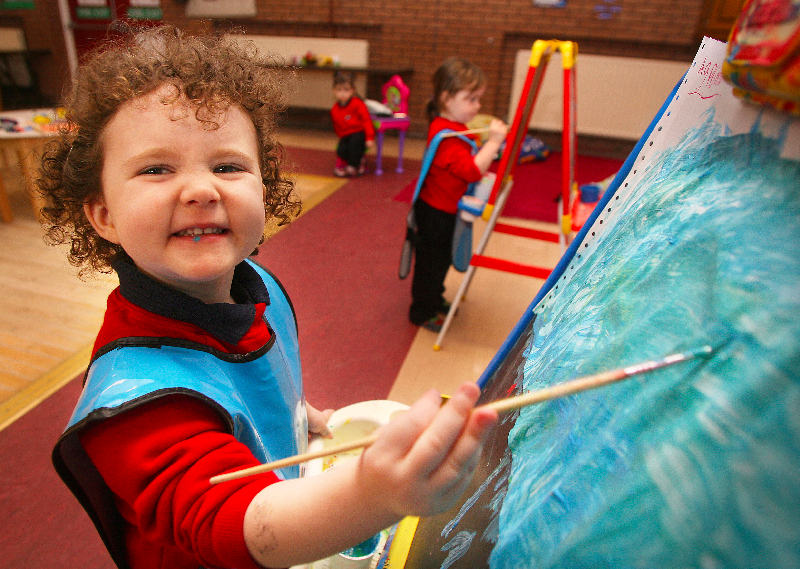 As of September 2006 there were over 400 schools providing education and early years learning to 34,500 children, outside of the Gaeltacht areas. This project will be carried out in the context of projected new school developments in the border areas and six counties. In the north of Ireland it is planned to open 21 naíscoil, 5 bunscoil and 3 meánscoil in the period 2006-2009. 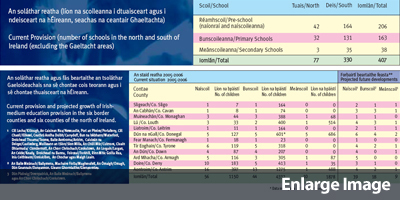 The draft Corporate Plan of Gaelscoileanna for the Republic of Ireland has identified the need to plan for an additional 18 naíscoil, 13 bunscoil and 6 meánscoil in the six border counties. Gaelscolaíocht Éireann (GSÉ) is togra úr í a bunaíodh mí Lúnasa 2006, le maoiniú ón Aontas Eorpach, le comhoibriú earnála poiblí trasteorann agus soláthar seirbhíse i sprioc-cheantair na sé chontae cois teorann agus na sé chontae i dtuaiscearet na hÉireann a fheabhsú. Aithníonn GSÉ na comhthéacsanna difriúla beartais sa Ghaeloideachas ar dhá thaobh na teorann. le heolas ar bheartas agus chleachtas a mhalartú agus le tionchar a oibriú air, trí roinnt faisnéisithe agus cuairteanna staidéir. le forbairt dhea-shamhlacha soláthar seirbhíse straitéisí a spreagadh trí fhoghlaim óna chéile agus trí phlé le saineolaithe as tíortha eile atá páirteach i bpróisis chosúla, sa Bhreatain Bheag agus in Albain go háirithe. le soláthar seirbhíse áitiúla a mhéadú trí pháirtithe leasmhara réigiúnacha agus áitiúla a thabhairt isteach sa phróiseas. Cad é comhdhéanamh Ghaelscolaíocht Éireann? Fuair an togra maoiniú faoi Chomhlacht Speisialta Cláreagraithe an Aontais Eorpaigh (CSCAE) Beart 5.2 Feabhsú Chomhoibriú na hEarnála Poiblí Trasteorann. Feidhmeoidh sé mar Choiste Stiúrtha trasteorann le hionadaithe ó na heochaireagrais ar a bhfuil freagrachtaí as Ciste Iontaobhais an Ghaeloideachais. Tionóilfidh sé fosta Fóram trasteorann do na heagrais uile a bhaineann le Ciste Iontaobhais an Ghaeloideachais le malartú méadaithe eolais trasteorann ar dhea-samhlacha cleachtais a spreagadh. Is iad príomhlimistéir oibre an Choiste Stiúrtha, díriú ar thaiscéaladh sochar forbartha comhthograí ar leibhéal roinne, aithint agus leathadh samplaí dea-chleachtais ar fud na tíre, agus aimsiú nuamhodhanna a mheallfadh tuilleadh acmhainní isteach san earnáil. Beidh ionadaithe ag an Choiste Stiúrtha ó Chomhairle na Gaelscolaíochta (príomhpháirtí), Gaelscoileanna (príomhpháirtí), Iontaobhas na Gaelscolaíochta (príomhpháirtí), Forbairt Naíonraí Teo, Foras na Gaeilge, Roinn Oideachais Thuaisceart na hÉireann (ROTÉ) agus an Roinn Oideachais agus Eolaíochta. bheith ina hionadaí don earnáil agus comhairle, eolas agus cuidiú a thairiscint do ghrúpaí a bheadh ag bunú scoileanna agus aonad. Iontaobhas na Gaelscolaíochta (www.iontaobhasnag.com), in 2001 a bhunaigh an Roinn Oideachais (TÉ) é de bharr gealltanas a tugadh faoi Chomhaontú Aoine an Chéasta leis an teanga Ghaeilge agus an Gaeloideachais a chur chun cinn. 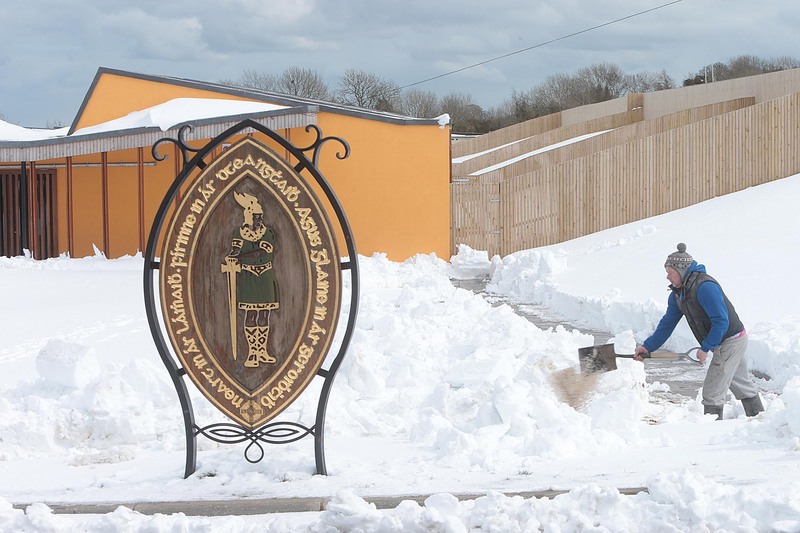 Is é a sainchúram tacaíocht airgeadais agus theicniúil a sholáthar d’fhorbairt Chiste Iontaobhais an Ghaeloideachais agus do thograí nach bhfuil i dteideal mhaoiniú phríomhshrutha rialtais. Oibríonn sé i gcomhar le Comhairle na Gaelscolaíochta i bhfeidhmiú Phlean Forbartha don earnáil. comhthadhaill leis an Roinn ar chúrsaí a bhaineann le Gaeloideachas, pleanáil, mar shampla, scoileanna úra, an painéal, coinníollacha i gcomhair aitheantais srl. agus, le hoiliúint inseirbhíse don fhoireann agus oiliúint do Bhoird Bhainistíochta a sholáthar ar réimse leathan ceisteanna. Forbairt Naíonraí Teo (www.naionraí.ie), is eagras deonach uile-Éireann é a thacaíonn le cothú sheirbhísí oideachais agus cúraim i nGaeilge do pháistí ó bhreith. In 2003 a bunaíodh é agus tá sé á rialú ag Coinbhinsiún na NA ar Chearta an Pháiste, an Acht Cúram Leanaí 1991 agus na Rialacháin Chúram Leanaí (Seirbhísí Réamhscoile) 1996. Tá ionadaíocht ag na grúpaí a leanas ar Bhord na Stiúrthóirí: Altram, Comhairle na Gaelscolaíochta, Foras na Gaeilge, Gaeloiliúint, Na Naíonraí Gaelacha agus Údarás na Gaeltachta. Faigheann Forbairt Naíonraí Teo. deontas i gcabhair ó Fhoras na Gaeilge agus ón Roinn Cirt, Comhionannais agus Athchóiriú Dlí. Cuireann sé ar fáil tacaíocht leis na seirbhísí a leanas a bhunú, a fhorbairt agus a riar tríd an Ghaeilge: naíolanna, naíonraí, seirbhísí iarscoile, campaí samhraidh agus grúpaí tuismitheoir/caomhnóir agus tachrán. Tá comhairle agus cuidiú ar fáil do dhaoine aonair agus do ghrúpaí atá ag iarraidh an Ghaeilge a úsáid le páistí. Foras na Gaeilge (www.forasnagaeilge.ie), i 1999 a bunaíodh é agus is é an comhlacht é atá freagrach as cur chun cinn na teanga Gaeilge ar fud oileán iomlán na hÉireann. tacú le Gaeloideachas agus le múineadh na Gaeilge. I mí Meán Fómhair 2006 bhí breis agus 400 scoil ag soláthar oideachais agus foghlama luathbhlianta do 34,500 páiste, taobh amuigh de cheantair na Gaeltachta. Cuirfear an togra seo i gcrích i gcomhthéacs fhorbairtí úra beartaithe scoile i gceantair na teorann agus sna sé chontae. I dtuaisceart na hÉireann tá beartaithe 21 naíscoil, 5 bhunscoil agus 3 mheánscoil a oscailt sa tréimhse 2006-2009. D’aithin Plean Corparáideach Ghaelscoileanna do Phoblacht na hÉireann go bhfuil riachtanas le pleanáil i gcomhair 18 naíscoil, 13 bunscoil agus 6 mheánscoil i sé chontae na teorann.